2:15 – It’s harder to calculate who’s really unemployed as more and more people take on solo-gigs. 13:50 – Is the stock market overvalued? It doesn’t look that far out of line if corporate profits keep raising, but if they fall, then yes they would be. “I’ve lived through quite a few recession and in almost every recession we have underemployment.” Tweet this! “There are components of the economy where we’re pretty sure that we’re getting worst service than we did a generation ago.” Tweet this! “One of the huge benefits of technological change is now you can outsource everything.” Tweet this! 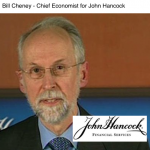 It’s my pleasure to welcome Bill Cheney to show, he’s a chief economist at John Hancock Financial Services and Bill, I don’t know where you’re coming from, where are you coming from today? I’m from Boston, enjoying the spring. Well, it’s great to have you on the show. I just want to dive in here and talk a little bit, maybe first about, one of the most important things and that is employed. Your take on the job market and future prospects. Well, as you say. It’s one of the most important things out there. It’s important to real people, it’s important to the Federal Reserve, and it’s been a consistent source of disappointment for the last 5 years or so. Clearly, the job market is improving. The unemployment is coming down, which ever measure you use, whether you use the one that says it’s 6.7 or 12.6 or whatever. It’s coming down. So that’s all good, but it’s been kind of at a glacial pace and certainly we’re still at a level of activity in the job market that feels like a recession to a large number of people. That’s true and it’s so much harder to calculate nowadays, because so many people have their solopreneurial gig. They’re doing contract work and things are inconsistent. Obviously, look at unemployment, you can’t just say that, obviously you kind of alluded to the labor force participation rate, but also the issue of underemployment I think is a significant one where we’ve got people with masters degree serving coffee at Starbucks. That’s not how it should be, right? Absolutely that’s not how it should be. I guess I have to say that over my career I’ve lived through quite a few recession and in almost every recession we have that phenomenon. People losing their jobs, it’s harder to get a job, and people are willing to take jobs who are beneath their qualification level. That hopefully changes as things pick up, as you get closer to something you might call full employment, and I think in every cycle, it feels as if it’s going to be forever. It feels like it’s never going to get better, but so far in my life, every time it does get better. New opportunities emerge and people start getting better jobs as well as more jobs. Well, that’s good to hear. I’m sure you’re familiar with the ride sharing service Uber, right? Do you use that in Boston? Right. I haven’t used it, but I have read about it. It’s a pretty neat service, Lift is another neat service that’s a competitor of theirs. It just strikes me as amazing whenever I use the services I always talk to the drivers. One of them just recently used to be an investment banker on Wall Street and now he’s driving a car for Uber. I thought, “Wow.” Talk about a change, huh? Well, absolutely. Again, I think this is something that you just have to realize happens in every cycle. In 1980, you were hearing all these stories about people with PhD and physics driving cabs, subsequently the physicists all got jobs on Wall Street and it was people of other kinds of advance qualifications to ended up in the cab in the recession. I think as I say that the normal progress of things will be, unemployment will come gradually down, gradually down, and eventually almost without noticing we’ll find the labor market actually got kind of tight, that wages are going up, and the people who were viewed as almost unemployable will start to get jobs again, kind of like the late 90’s. The problem is for any individual, it doesn’t mean your skills will end up being worth anything and that’s really the problem. From one decade to the next, different people find that theirs skills are in demand and some significant chunk of the population like former cab drivers, may find that their jobs are going away to Uber or some brand new competitor that we haven’t even thought of. Yeah, it is amazing. I mean, there’s so much amazing technology and so much innovation coming out of the world today. It’s very exciting, no question about it, but it makes for a very quickly changing demand level in the labour market and the skills are always changing. The one thing that I think we can all agree on is that spending a fortunate on college and going into a massive amount of debt for a liberal arts degree is probably a pretty bad deal. Argue with me if you wish, but ah.. *Laughter* . It just kills me to see that kind of stuff. Yeah, I’m not 100% certain about that, but I do think you’re probably right. I certainly feel as though there’s been something out of quilter in terms of the rate of which colleges costs have gone up. It’s not that liberal arts degree is a bad thing, I think that a lot of contexts in which it can actually be a valuable training for how to acquire and use knowledge of which maybe transferable to a lot of other activities, but the cost is out of sight.. The cost in particular has not been, does not seem to have been affected by all the technological advances which have driven down the cost of doing business in other sectors. I think, it’s unclear at this point whether that’s inherent in the nature of education or whether it’s because of the institution or the restrictions that we have in terms of accreditation and sort of hostility to massive online courses and qualifications acquired through for-profit institutions. I suspect there’s going to be a lot of competition in education and it’s actually going to drive down the average costs. Going to Harvard will still cost a fortune, but a degree, a useful degree, may get cheaper. I can hardly wait to see that, Bill, and I just have to think that these people in the ivory towers of academia are shaking in their boots with what’s going on. I mean, the fact that they can’t sell education at lower prices when they’re doing..so many colleges students are taking their courses online now. There’s a completely scalable, inexpensive delivery process, and then you look at all the free education out there. I’m a huge fan of the Khan Academy and there are many other things out there that are doing this too. The real thing that’s allowing this monopoly to still exist is the government, student loan entitlement complex, because they’ve driven up the prices. If the government didn’t insure student loans, the money wouldn’t be out there for the universities to grab, and the cost of college would be set by the marketplace rather than some ridiculous amount of pell grants and all these different scholarship options. Gosh. We don’t need to make this the topic of the discussion, but isn’t it frustrating? *Laughter*. It is also a frustration and it’s so clear that you know, if you dump a lot of money into a given system, whether it’s education or health care or housing, space travel or something, is the first thing you tend to do is to drive up the price of the scarce resources that are used in producing them, like professor salaries, astrophysics, or whatever it may be, or houses. Those things are all very much driven by the availability of funds to buy them. No question about it. Let’s get your take on some major parts of the economy and what you see, because you have feedback investors, your company’s clients, also, of course, your own research and your own thinking. What’s the sentiment out there in terms of the stock market, the overall economy, housing? Well, we sponsor a quarterly investor sentiment survey to answer precisely those kinds of questions and we ask questions of a decent size sample of people who have not huge incomes, but sort of decent middle-class incomes and a chunk of money to invest. What we’re seeing, which I think is consistent with my reading of the overall economy, is that they’re steadily feeling somewhat better. From one quarter to the next, it seems like people are getting little less worried about the things that worry them, a little more confident about their financial status in the future, in particular in retirement, and therefore, I guess, a little bit more optimistic about investing in what would other wise be considered very risky assets like stocks and houses. We are seeing that marching along. Now, it’s not that anybody thinks the happy days are here again. People are still very worried about politics in Washington about the natural debt, about health care costs, about potential changes to social security, about oil crisis, there’s a list. The intensity of those concerns seems to be going down at a time, each quarter we see a slightly smaller percentage of people being concerned or very concerned about those issues. To me, it’s a valid reflection of the fact that, despite the gloom and doom talk that we’ve lived through after the financial crisis, the worst scenarios did not come to past. You’re always worrying another recession or some financial meltdown happening else where in the world and sucking us down in a vortex all over again, and those things did not happen. I don’t know. You sure? A lot of people into foreclosure, lot of people walked away mortgages by choice, the banks got a lot of tax payer money. I don’t know, isn’t that the vortex? *Laughter*. I think because things were so uniquely awful that was why there was such a high level of fear about things really going down the tubes, but if you compare now to early 2009 when President Obama was being inaugurated for the first time, it really felt as though we were just skimping into oblivion, we were facing the re-run of the 1930’s, and we didn’t. We had some very dark consequences as you say for mortgages, employees, and so on, but the unemployment rate peaked at about 10%. In the 1930s, it was 25% and it wasn’t obvious at that moment that we weren’t going to be 25%. I think the darkest fears, which of people were both peddling and just feeling on their own now, not crazy reason, those darkest fears were not what came through. What did happen was not good. I mean, we’ve been struggling, trying to recover in a way that, I think, is deeply disappointing and probably means we didn’t do all the right things; but one way or another we’ve been on this gradual struggle of things getting a little better each year, from what year to the next, to the point where now it seems to me that the economy is poised to grow significantly faster. I think people are better off in terms of health prices and equity values and therefore are all on pay plans, if they have them, companies value sheets are pretty strong, banks have kind of recovered, so the things that were holding back the economy the last couple of times started to recover, I think, are probably easier now. I think that’s what’s been reflected in that survey of investors, I think that’s what’s really going on. So, what do you think about stocks though? So many people are saying that the stock market is overvalued at this point. I certainly see the reason why you’d worry about that and it’s certainly is true, while I think the stock market is a decent proromiter of how the economy is preforming, it certainly gets ahead of itself sometimes. The poster child of that was the 1999 – 2000 period. When I look at sort of economy wide top-down look at the stock market and look at the total value of all corporate stocks rather relative to the total value to all corporate profits, it doesn’t look that far out of line from historical averages. Now, historical averages are just historical averages, I mean they’re not..they don’t prove that they’re going to stop at any particular level, but it does suggest to me that stock values are not radically out of line provided that companies can go on making the profit margins that they’re doing now. If profits should drop for any reason, then the stock market would turned out to have been overvalued, but if corporate profits keep on raising at the kind of pace that I think is likely in an expanding economy, then I think we’re going to find that stock prices were reasonable enough and probably just as likely to go up or down. Are you saying that from a Price to Earnings ratio perspective? Well, it’s sort of like Price to Earnings ratio when I look at these economy wide numbers, but they’re not the PE ratios that you’d get from financially report anywhere. It’s more the numbers which I pull out from the National Income Statistics the things that go into GDP, sort of total corporate profits and total value of corporate equities. I think it’s kind of like a PE ratio, it’s the same idea, but as far as I’m looking at it, that ratio doesn’t seem to be out of whack with history. You made a statement a couple of minutes ago about an expanding economy, so I was wondering if you have any thoughts on…Do you think the economy is expanding now? Oh, absolutely the economy is expanding, I mean, we still have positive overall economic growth. GDP is kind of a fuzzy concept, but it is expanding and in the meantime, we are still seeing job gains. If we get a 190, 200,000 jobs a month that is definitely a sign of a healing economy. I don’t know whether I’d say healthier yet, but certainly healthier than it has been. You said the GDP was a fuzzy concept and I agree with you. My question was a bit of a trick question, I’ll admit, because I wanted to ask you, Bill, your thoughts on the real rate of inflation. I mean, do you go with the governments number, the official states, the CPI, or do you have your own thoughts as to what it really is? I think the CPI is about as good an estimate as you can make, I noticed a lot of us economists like to talk about what we call, the core CPI, which means excluding food and energy, which obviously annoys people a lot, because well of course. *Laughter*. Yes. It annoys me. *Laughter*. I have to pay for food and energy and the point is not to pretend that food and energy don’t affect the cost of living, but the point is is that they’re both kind of volatile and they don’t represent a very good predictor of what inflation is going to be the next month. If you’re looking what inflation is like, it could be six months down the road, you get a better idea from filtering out all the fluctuations of food and gas prices and looking at the trend underneath that. Now, you have to come back ultimate and look at what the actual overall level really is to get a grip on the cost of living. I think the reality is that in fact inflation is remarkably low right now. There are some components of it like, what we were talking about before, college tuition, which are still going up way too fast. Health care costs have actually slowed down, but they’re still going up faster than the overall CPI, but all these different items are weighted together in, I think, a more or less in an accurate proportion to how big they are in the average person’s budget. If your budget happens to be heavily weighted towards two college age kids and some health problems, then you’re all facing extremely rapid of increase in prices, but if your kids are either out of college or a long way from college and you’re all healthy in the family and you’ve already got a fixed rate mortgage and etc, then you’re facing very little inflation at all. I think it averages out to what the government is telling us. I would also add actually that a bit of inflation is not the worst thing. I think the idea that we would all be better off with zero inflation or inflation particularly hurts the less well off, I think that’s a mistake. I buy the Phillips Curve argument and I agree with you to a small degree and I think ultimately inflation is a really good business plan for governments, especially those we are irresponsible, because that’s all of them. They all like to palter and buy votes with money they can print. So it’s a pretty good business plan really. It’s better than the alternative, it’s better than deflation, which I think is a pretty scary thing because it causes people to put off decisions, closes the philosophy of money, and that can have really traffic consequences in many ways. I won’t argue with you there, but the reason why I asked you about growth and do you think the economy is growing, a very generic question, and then about inflation is because when you look at inflation versus GDP, regardless of what you think the real GDP is or the real rate of inflation, are we just trending water? *Laughter*. Well, honestly I don’t think we’re just trending water. When you look at the underline sort of real variables, are people getting more…able to afford more stuff or better stuff overtime? I think the answer is actually yes, but if you look at a car that you can go out and buy now for whatever, $25,000 or something, it’s going to be a whole lot better than a car you could have bought 15 years ago. There’s all kinds of extra features and safety measures and the same is true with the stuff you can buy with your health care dollar. It’s better than it was in the past. You’re getting all these dimensions of progress quite apart from the sheer scale of the economy. In fact, we’re creating jobs and producing more stuff. You can argue whether, you can get into a more Buddhist argument about whether more stuff is actually good for you, you know from the materialist perspective of, an economist preservative, we are producing and getting more and better stuff over time. Well, true. That’s what the people that run the inflation indexes would say is that should be adjusted with hedonic and so, I mean do you believe in that? The concept of hedonic adjustments? Well, that’s a tricky question too. I mean, I do believe in it for precisely the reason that I was giving you. You can look at a basket of good and say, “Well, this would only cost you x dollars in 1965.” but then you start looking at it, that basket of goods in 1965 would have been junk. You wouldn’t have accepted 1965 quality healthcare now. You wouldn’t probably even be allowed to drive an 1965 quality car in many cases now. Things really do change over time and to a considerable extent they represent improvements that should be reflected in price indexes, but we’re not really good at reflecting in reductions over time, which probably should be attributed to the service sector in many cases. I don’t think..
Well, I mean. There are certainly components of the economy where we’re all pretty sure that we’re getting worst service than we used to a generation ago, when..
Yeah, I don’t really know if that’s really true either by the way. Well, it’s true in some cases, it’s definitely not true in others. If you think of financial services and how impersonal and obnoxious banks are, but at least they’re open and you can go to the ATM. And they’re open longer! When I was younger, the bank used to close at 2-3 o clock in the afternoon. Exactly, there used to be bankers hours and now bankers hours are pretty long. In a lot of ways I think hedonics are a very complicated question in terms of what is the quality of goods and services going up or down or sideways, but commodity by commodity I think it’s actually quite important for the statustitions to measure the stuff and try and reflect it in the prices of services that go into the CPI. That’s an interesting thing that you just said, I just want to purpose a different idea to you on hedonic adjustments and we don’t have to go into this too deeply. I know we have to wrap up here, but I believe logical hedonic adjustments make sense, I don’t argue with any that. However, when you look at the big picture; you mentioned the Buddhist argument about materialism and so forth, so I’m going to give a big picture idea too; and it kind of says that we’re not entitled to progress. Why should the progress be adjusted into the index to make the inflation look lower? If we get a computer that’s twice as fast nowadays as we got two years ago and the index only says it really costs half as much of their version of real dollars, doesn’t it say, “I’m not entitled to that progress?” Aren’t we entitled to have everything get better, and cheaper, and faster, more useful? I don’t know whether I used the word entitled, but certainly the whole point of the economy is to deliver more, better, faster, whatever, is to make our lives ‘better-er’ at the time, but I think the point of the CPI is to measure how much better. It’s not a pretense. If the price of everything goes up by a factor of two, but everything is also better by another factor of two, then you want to figure that in to any estimation of how good your life is economically, what your standard of living is. The point of the CPI is be able to pull out of your estimate of the increased standard of living, the part that is just the change in prices, but you don’t want to pull out of it the part of it the improvement of healthcare services or the..now I mean, computers. I do have a problem with that because I’m not sure the increased power of the computer, if it’s twice as powerful, that in any sense is twice as useful. There’s some quirkiness there in the high-tech area. There is quirkiness and especially because all of our competitors have it too, so if we’re in business and our computers are twice as fast, so are our competitor. It’s really the same, we’re just playing on a level playing field. You’re the only one with the fast computer right and have some big advantage in the market place. Of the business that’s true, but the point of the CPI is to measure the cost of things to final consumers and the fact that I just bought a new mac to replace my 7 year old mac and it’s way better. I mean, it’s more fun, it’s quicker, it enables me to do things, I mean, the old one wouldn’t even TurboText, so I’m better off now with that new computer, even though it didn’t cost any more than the old one did 7 years ago. Yeah, makes sense. Make sense. Well, listen, I’ve kept you a little longer than we originally planned, so I apologize for that, but this is an interesting discussion. Before you go, first of all, give out your website if you would, Bill. Absolutely. If anybody is interested in our investor sentiment index and any other information about financial products, go to JohnHancock.com. That’s the company website, a simple name. Just maybe one more thing, before you go, whatever you want, concern about the national debt, healthcare costs, do investors think it’s okay to buy big ticket items right now? Whatever you want to just wrap up. Yeah, our surveys are showing investors on the whole feel like this is a good time to buy big ticket items, to buy a home, which of course is the biggest of big ticket items for most people. They do perceive this is a good time to taking a little more financial risk than they would a quarter ago or two quarters ago, but it’s still kind of on the edge. Most people are still very curious about the idea, for example, of starting their own business. The nice thing about starting a business nowadays though is that it’s so inexpensive. I mean talk about deflationary pressures of technology, huh? You can start a business and…like there’s a book that’s called the $100 Startup. It’s kind of true! You couldn’t do that 10 years ago! Yeah, that’s right. I mean that’s one of the huge benefits of technological change is now you can outsource everything buy the drink, à la carte. If you need a little bit of computer services, a little bit of computer storage, a little bit website, as you say, next to nothing. That is a fantastic thing and overall it leads to a lot more innovation, because all of those entrepreneurs with ideas can come out of the closet if you will and bring their ideas into the market place whereas a lot of them couldn’t be. That just bodes very well for the future. It gives me goosebumps thinking about..we’ve seen what’s happened over the past 5-7 that technology has become really, really exciting and it’s only going to get so much better in so many areas. Yeah, I am absolutely with you on that. I think the ability of young people to create apps and start a business or almost anybody that’s start a business and see if it flies and if it doesn’t, no great loss. What Joseph Schumpeter called creative destruction. Creative destruction has become a lot less expensive than ever before. Well, Bill Cheney thank you for joining us today, really interesting discussion.